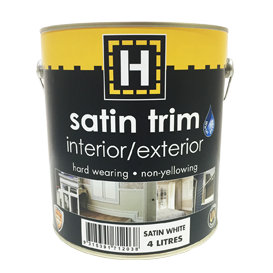 H-brand satin trim is a self cross-linking 100% acrylic architectural paint which has a specially formulated "non-stick" finish. It combines easy application, low odour of a water-based paint with the self-levelling and toughness of an alkyd enamel. For interior and exterior doors, architraves, windows, skirting boards and cupboards. Not recommended for benchtops or flooring. This product is compatible with all major tinting systems. For more detailed instructions ask for a product information sheet. Sizes 500mL, 1 Litre, 2 Litre, 4 Litre, and 10 Litre. Coverage Up to 16m² per coat per litre. Ventilation Allow adequate cross ventilation during and after use to dissipate water vapour. Clean Up Do not pour leftover paint down drain. Wash all equipment with clean water. (See Product Information Sheet for disposal). Any dried spots may be removed using methylated spirits and a clean cloth. IMPORTANT Keep out of reach of children. Paint container must be properly sealed at all times when not in use. Environment Low odour. Low V.O.C. Environmentally friendly. Enter in a word or phrase to search our product list. Copyright © 2011 - 2019 Duralex Paints Pty Ltd.